Add all ingredients into a large mixing bowl and stir until well-combined and a soft dough forms. Place dough on parchment paper and press with your hands to flatten it out evenly. Cut the dough into bars and store in an airtight container in the fridge until ready to enjoy. To keep the bars from sticking together, place a piece of parchment paper in between each bar. If the nutrition labels on your favorite protein bars have you feeling less than impressed, you’re not alone. These days, there are too many bars and snacks claiming to be good for you because they’re packed with protein or fiber or superfoods; but as any good Grasshead knows, you sometimes need to weed through the claims to find the good grass (hey, we’re punny too). Don’t worry, we’ve got good news. We made a 4-ingredient protein bar with our Smooth Chocolate Protein & Kale, which means there’s complete plant-based protein from quinoa, pea protein and chia seeds, and an entire cup of hearty kale in every batch. All you need to do is mix the Protein & Kale powder with 3 other simple ingredients that you may already have in your kitchen. 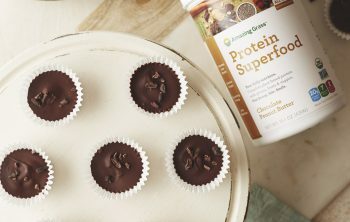 Yep, it really is that easy to whip up a high-protein superfood snack at home! 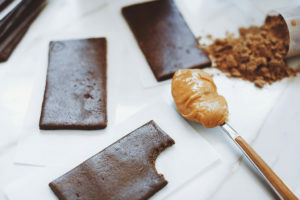 So unless you like eating sugar alcohols, high fructose corn syrup, and soy protein isolates, this 4-ingredient homemade protein bar recipe is for you! This recipe really is so much more than a simple protein bar. Since it’s packed with kale, you’re also getting plenty of other high-quality nutrients like iron, vitamins K, A and C, antioxidants, fiber and calcium. Plus, we grow the organic kale ourselves on our family farm in Kansas, so you know it’s the real deal. We’ve been organically growing the most nutrient-dense greens on that family farm for more than three generations, and we count ourselves lucky. Every hour, 175 acres of US farmland is lost to development, and small, family farms are getting hit the hardest. That’s why we partnered with American Farmland Trust to raise $50K with your help to support the preservation of US farms and farmland. There are 2 easy ways for you to get involved, and we’d be honored to have you on this journey with us. Learn more, here.